The movie is schizophrenic, mostly a comedy but with some very serious elements. Musical narration is provided by troubadors Nat King Cole and Stubby Kay as Professor Sam the Shade and The Sunrise Kid, kind of a western Greek chorus. Although the Cat Ballou of the title is Catherine Ballou, a recently-graduated schoolteacher played by Jane Fonda, this is actually an ensemble comedy dominated in some ways by Lee Marvin, who won the Oscar for Best Supporting Actor for his performance(s) in this film. After an education in the east, Cat Ballou is returning by train to her father’s ranch in in Wolf City, Wyoming, in 1894. On the train she meets Clay Boone (Michael Callan) in the custody of a sheriff, and Clay’s religious-minded uncle Jed (Dwayne Hickman), a couple of charming small-time criminal ne’er-do-wells who make an escape from the train. Once home, she finds her father under threat by the Wolf City Development Company, owned by Sir Harry Percival (Reginald Denny), which wants his water rights for a large planned slaughterhouse. He’s holding up all right, but she sees him threatened by silver-nosed gunman Tim Strawn (Lee Marvin). All her father has for protection is Clay and Jed, neither of whom has ever shot at any one, and Jackson Two Bears (Tom Nardini), a good-natured but not very intimidating Sioux ranch hand. 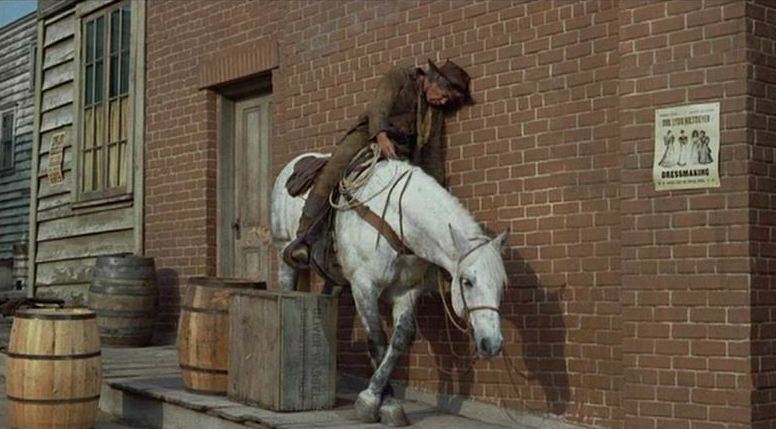 So Cat sends for dime-novel gunman Kid Shelleen (Lee Marvin again), only to find upon his arrival that he is now a useless drunken sot. 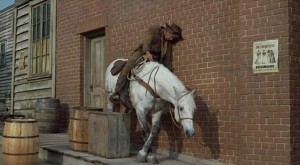 Strawn easily kills Frankie Ballou (John Marley), and when Cat tries to get the sherriff’s help, she finds that Sheriff Ed Cardigan (Jay C. Flippen) is one of those providing Strawn with an alibi. The community wants the slaughterhouse built. Evicted from the ranch and filled with frustration, Cat and her gang retreat to Hole in the Wall, where a very over-the-hill Butch Cassidy (Arthur Hunnicutt) is a bartender. They carry out a train robbery which nets them $50,000, much more than they expected. Kid Shelleen has a moment of soberness, in which he returns to his former gunfighting self, dresses in his old gear, seeks out Strawn in a bordello and shoots it out with him. 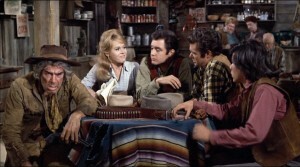 As Shelleen describes it later to the gang, they are surprised to hear that Strawn was his brother. We are less surprised, since both characters are played by Lee Marvin. Determined to get Percival to sign a confession, Cat dresses as a lady of the evening and meets him on his special train car. They struggle for her gun, Percival is shot, and Cat is sentenced to hang by the disappointed citizens of Wolf City, whose dreams of slaughterhouses and jobs are now gone. Needless to say, the movie doesn’t end with Cat’s hanging. Marvin and co-star, holding up a wall. It took them an hour to get this still. 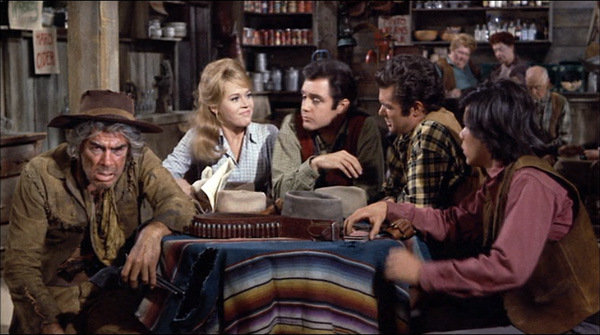 Young Jane Fonda is good, and the rest of the supporting cast (Michael Callan, Dwayne Hickman and Tom Nardini) are engaging as well. There are some good lines and a fair amount of sexual innuendo, but the movie doesn’t really seem to care much about the romance element. Occasionally the music telegraphs a little too strongly what we’re supposed to be feeling: The immediately rollicking music when a fight starts tells us a little too quickly and heavy-handedly that we’re not supposed to take it seriously, for example, and the rattlesnake-like sounds when Strawn appears don’t really afford us the opportunity to make our own assessment of him. He’s scary enough with just the silver nose. Director Elliott Silverstein also directed A Man Called Horse a few years later. Mostly his career was spent in television. Maybe that accounts for the heavy-handed use of music, the charming but lightweight supporting characters and the easy but incomplete resolution. Still, it’s fun to watch. This entry was posted in 55 Greatest Westerns and tagged Lee Marvin, Western Comedies on September 4, 2013 by Nicholas Chennault. I’m surprised you include this one in the list of Great Westerns. Also, Jane Fonda’s posture in the first picture here looks hideously unnatural. She couldn’t hit anything with that gun, and might also have a club foot. Your description still makes me want to see it, if only to catch the performance of Lee Marvin. And his horse. Any list of great westerns is highly idiosyncratic, including this one. There will be those who will question (eventually) why I left off any spaghetti westerns, especially those with heavy cinematic pretensions (The Good, the Bad and the Ugy; Once Upon a Time in the West). Similarly, why would I include light stuff like this, or The Hallelujah Trail (today’s featured great western)? Or, when I get to it later this week, North to Alaska? At the end of the write-ups on the 55 great westerns, there’ll be a list of movies for which a case can be made that they’re great, although I didn’t include them on my official list of greats. As for the photo of Jane Fonda, you’re right–she couldn’t hit anything in that pose. I believe it’s intended to be suggestive (and not of shooting). And if she stays in the pose very long, her back’s going to hurt. Am I right in assuming this was included because it’s got something you won’t find in other westerns? So maybe it’s not so much a “this is one of the best westerns”, but more of a “if you’re looking to see all the westerns that have something to offer, you shouldn’t miss this one”? That might also explain why more of the spaghetti westerns aren’t included on your list — you have a representative sample and the others would be more of the same. In fact, there will be no spaghetti westerns on the list of 55, although there are several that I think western fans ought to see. The question becomes a little more pointed when when we get to a discussion of the five or six greatest directors of westerns, because Sergio Leone is on the list. How can he be one of the greatest directors of westerns if none of his movies are among the 55 greatest? A response to that question will be given in due course. Wow, I guess I really do need to watch it then.